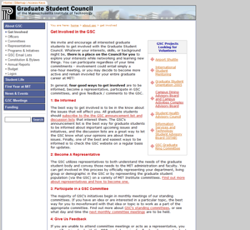 In good MIT fashion, the GSC website has been designed in a very scientific fashion in all aspects ranging from the layout of content to the way code is written to the colors used. Attention has been given to issues of accessibility, usability, standards compliance, aesthetics and sustainability. Some features of this site are described below. You can also take a look at the site credits to find out who is responsible for creating this website. 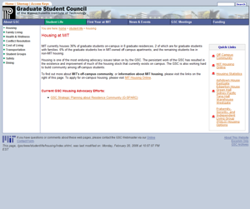 Testing the site for accessibility, usability, etc. 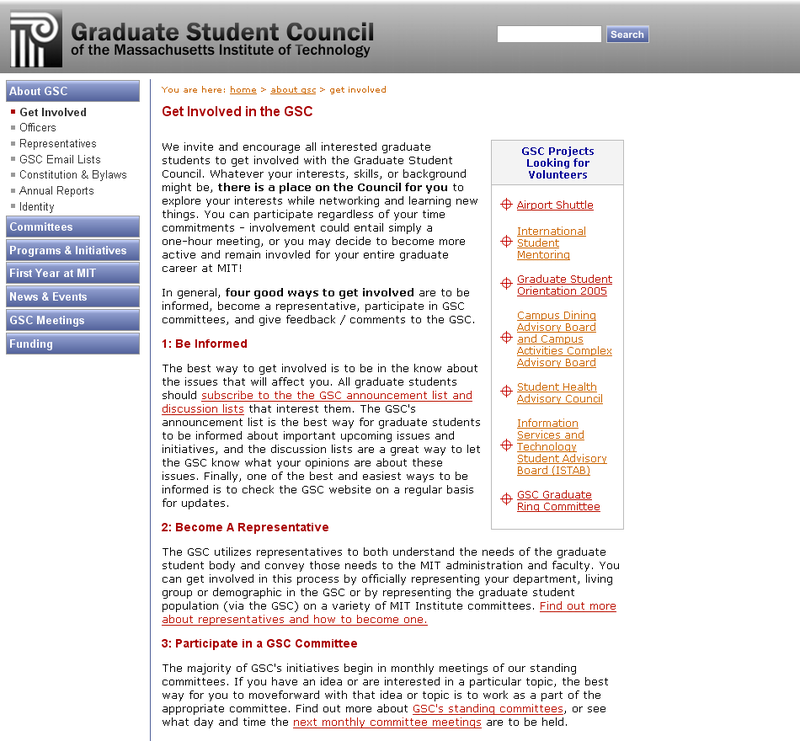 The effort was led by graduate student David M. Collins, and involved various members of the GSC Executive Committee and IS&T. 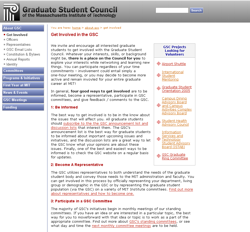 The main banner for the GSC website was created by graduate student Moneta Ho. 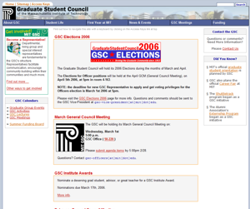 Graduate student and GSC Exec Com member Barun Singh designed the new website, which included all of the templates and the color scheme. He also migrated all information from the old website, tested for multiple browser and platform compatibility issues, and performed extensive testing for W3C and accessibility standards. 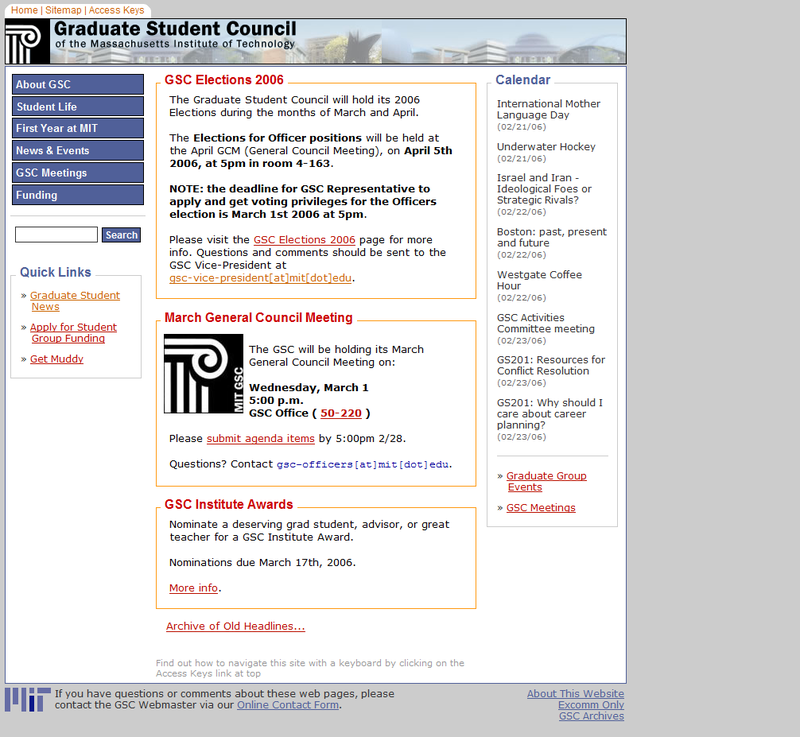 The revamped website (shown below) was publicly launched in late July 2003. By the end of this process, the website was a complete success - visitors to the site had increased tenfold, and it became an essential resource that was also easy to maintain. 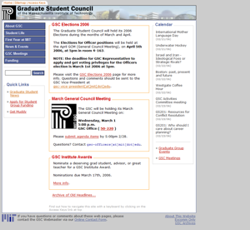 In the Winter of 2006, GSC Webmaster Nici Ames revamped the GSC website look, and added dynamic content to the home page. The officers could now update headlines on the home page from a web browser, instead of having to log in to Athena to update static code. 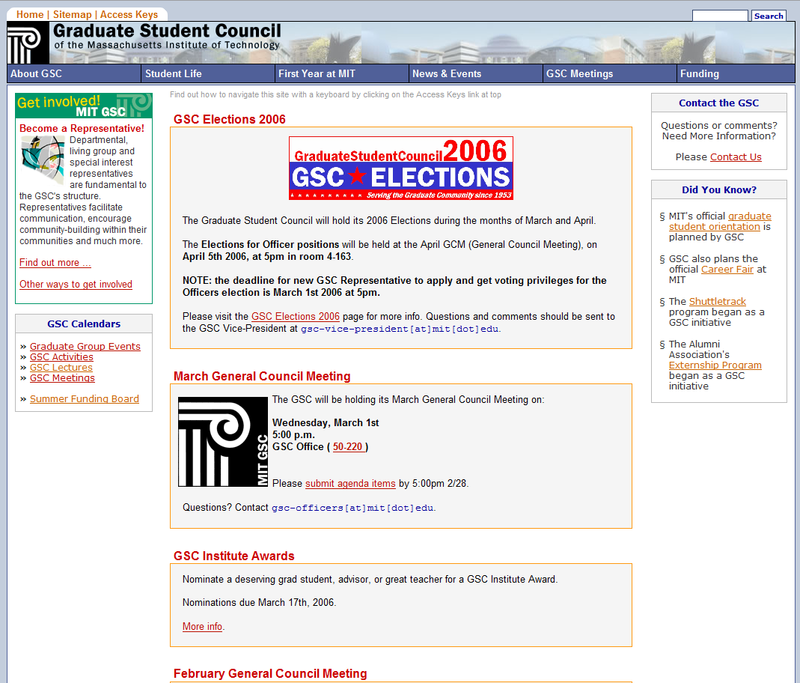 Additionaly, an RSS feed for all GSC sponsored events was created and displayed on the home page. 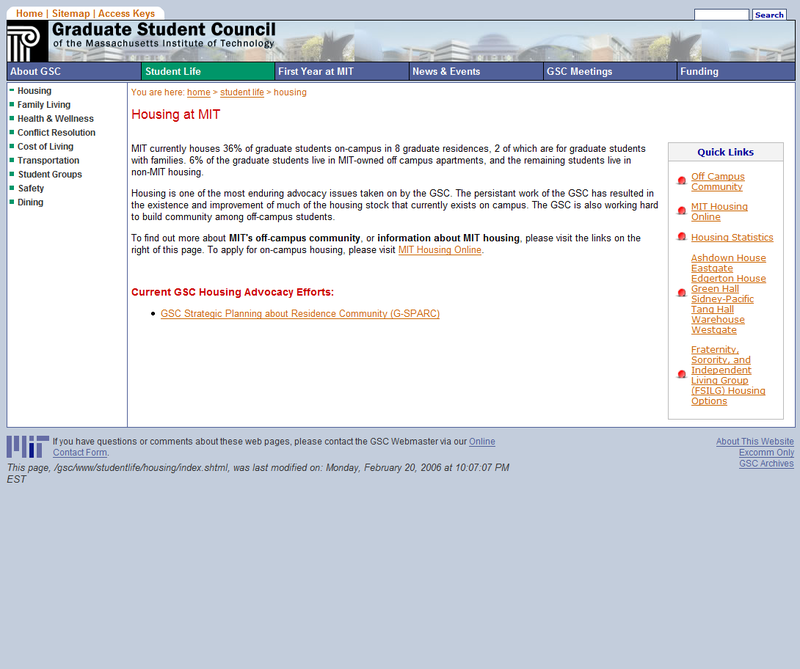 The new pages are shown below. 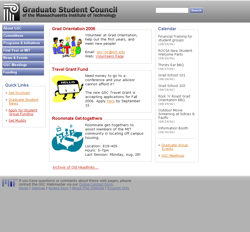 In the Summer 2006, the site navigation was restructured by the current Excomm, and the style of the pages were once again updated by Nici. 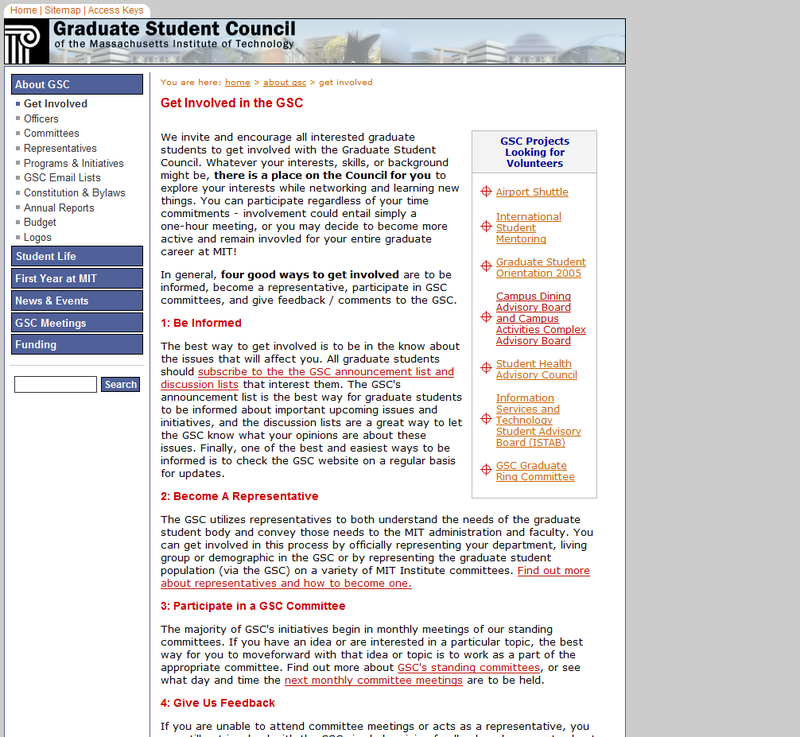 Some example pages are below.